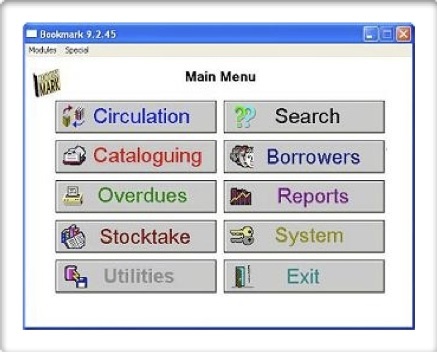 Book Mark Library Services sell and support the easy to use Bookmark Library Automation Software. Designed for small to medium sized libraries such as schools. Ease of use means over 2500 schools use Bookmark. In some primary schools the library is run by students. Bookmark is also used in specialist libraries such as Adult Migrant Education Centres, Theological Colleges and Victorian Canine Association. Book Mark was designed to be easy to use for primary school age children and teachers. The main program includes easy catalogue data entry on a single screen or download records from SCIS. Student borrowers can be quickly entered from most school admin systems or typed in manually. Easily print overdue lists and notices. Comprehensive and easy to use reports can be customised. Simple & fast backup system. Stocktake all or part of the collection. Works on all computers running Windows XP or later. Book Mark Library Services supply a range of products for your library automation needs including barcode labels for your books, spine labels and barcode readers both USB and wireless models for stocktaking direct from the shelves. We help you every step of the way whether installing a new system or changing over from an existing system. In addition to our on site training we regularly conduct training in Melbourne and regional centres of Victoria. Fast efficient support is only a phone call away. For more details download the Bookmark Information below.